Create a spreadsheet which randomly assigns the # cars arriving per minute using the probabilities above, allows you to input a number of tollbooths, and which tracks the back-up of cars over a 1 hour period. Fill in the following table (by hand no Excel) assuming there are 6 toll booths constructed. This is VERY IMPORTANT, you must do this paper and pencil exercise first and understand what you are being asked to do before you can hope to create a spreadsheet! and the number of cars your booths can “process” in 1 minute. A table turning the probabilities above into cutoffs for use with a VLOOKUP This function will look up a random number in the table and return the number of cars for that minute. Remember how VLOOKUP works, the cutoffs are the left hand endpoints for intervals, your first interval is from 0 to 0.12 (which represents the 12%). Columns for Minutes, New Arrivals, Total Cars, Departures, Back-up. Your formulas should link to the named cells from #2 whenever possible. 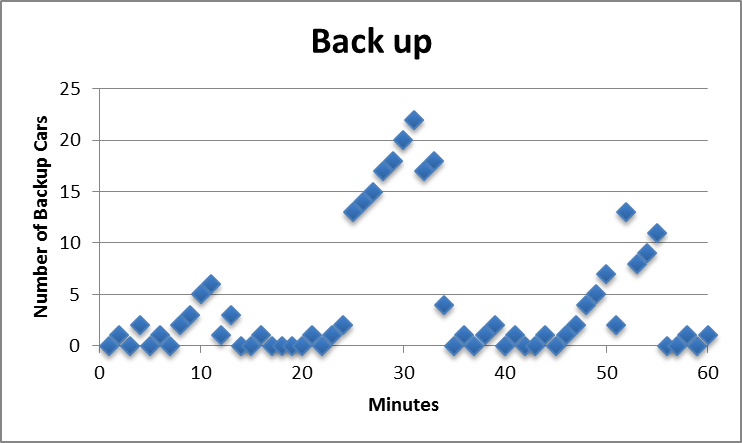 A scatter-plot showing the back-up for 1 hour. Assume each tollbooth will cost $1 million to construct. Each day there are 5 peak hours of traffic, with an average fare of $2.20 per car, and a cost of $45 per booth per hour for the operator. Compute the amount of money you can expect to make (fares – operator cost) during 1 peak hour of traffic for the given number of booths. Compute how many days it will take to pay off the construction of your tollbooths. Assume during non-peak hours the costs and fares cancel. A textbox with your recommendation for the number of tollbooths to construct with explanation. Whatever number you recommend, you must explain why you did not choose the number above and below.